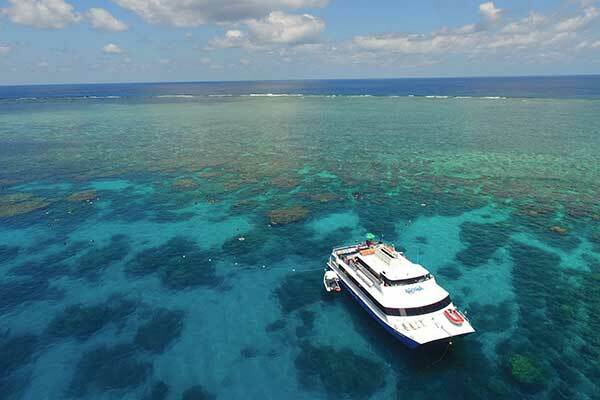 Home » Blog » Dive Into a Natural Wonder at the Great Barrier Reef! Australia’s Great Barrier Reef. One of the Seven Natural Wonders of the World. The largest single organism on the planet. Stretching over 2300 kilometres and 900 islands, the largest coral reef system on Earth is a “must-see” on most people’s bucket lists. In fact, it is probably on your personal list! Reef Magic Cruises offers the perfect way to tick this item off. Imagine starting your day by boarding a comfortable and speedy catamaran before being whisked off to spend the day among the reefs. A presentation with our onboard experts about the unique marine biology of this rare ecosystem makes the already fast ride even shorter.And then, it is all around you. The dazzling Great Barrier Reef spreads before you seemingly endless in all directions. Fish of vibrant and electric colours dart beneath you. Sea anemones and other aquatic life peek around the edges of the reef. You just can’t wait to explore it! Luckily with Reef Magic Cruises, you don’t have to wait! You can dive right in and spend the day immersed in the magic of the reefs. Whether you want to snorkel, SCUBA dive or just observe this fascinating world from the comfort of a glass bottom boat, Reef Magic Cruises can make it happen. Your day starts with a 9 am departure from Marlin Jetty in Cairns. Before you know it, you have arrived at Marine World on the Outer Great Barrier Reef. From this point, you get five whole hours to explore the reefs to your heart’s content! During that time, guests are provided with all necessary equipment for snorkelling, including wetsuits. Guests are also treated to tea in the morning and again in the afternoon, as well as a delicious buffet lunch and plenty of tea, coffee and drinking water throughout the day. There are onboard showers, changing rooms and even a sun deck for the guests to use. This day is more than merely a fun experience. Guests on Reef Magic Cruises are treated to interactive presentations and are taught to identify the marine life spread out beneath them. Still not sure what you see? Guests have a complete collection of reference materials to peruse. Reef Magic Cruises makes it simple to explore this natural wonder. All you need to do is sign up! But don’t wait too long. Sadly this awe inspiring beauty is fading fast. Don’t miss your chance to witness Australia’s Great Barrier Reef for yourself!